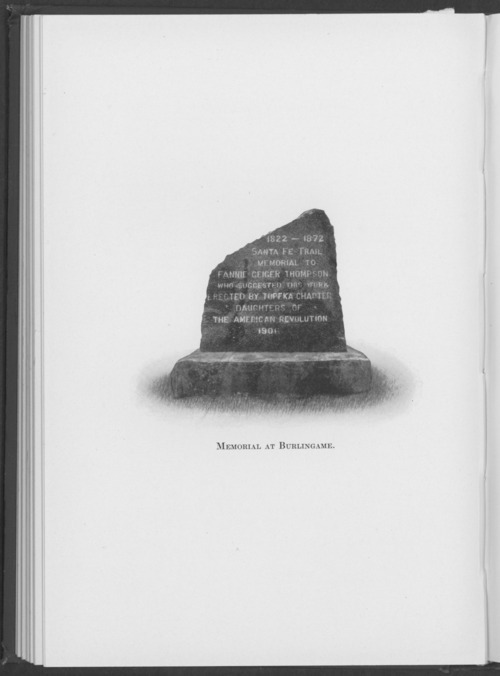 This photograph from the book, "Marking the Santa Fe Trail", shows the granite marker in Burlingame, Kansas. The red granite stone was placed on the west side of the Switzler Creek bridge east of Burlingame, between Topeka Avenue and Santa Fe Avenue. It was later moved to the southwest corner of Santa Fe Avenue one block west of where US 56 turns south. The Topeka chapter of the Daughters of the American Revolution erected the monument to honor the memory of Fannie Geiger Thompson who worked to recognize the trail.